A large part of the feedback for the Atlas was provided online using both dynamically created (personalised) results and static web pages updated nightly. Some of the key ways that progress could be gauged, and gaps identified, are shown below. View of species list for users once logged-in to the Bird Atlas Online web application. Although it was useful to see a list of species recorded in an area, it is not always immediately obvious which species might be missing. For this reason an option called ‘Priority squares’ was built which shows, for any 10-km square, the species most often recorded in the neighbouring squares but apparently missing from the focal square. For example, Mallards were recorded in winter from all eight squares surrounding SH90. As an aid to monitoring coverage and the accumulation of distribution records in 10-km squares, species richness in each square was compared with the richness observed in the previous atlas, allowing a crude indication of progress. The map shows the situation at the end of the Atlas for winter species richness. Most of the map is red, indicating that at least 90% of species had been recorded. Towards the end of the Atlas we also produced ‘inverted’ maps showing the percentage of species ‘missing’ to help pinpoint the areas in need of last minute coverage. In virtually all 10-km squares a high proportion of the anticipated species total was recorded in winter, making the Bird Atlas dataset truly comprehensive in its spatial coverage of Britain & Ireland. For the corresponding maps of species richness in the breeding season, species only counted towards the total if they were present in the 10-km square with at least possible breeding evidence. Separately, we presented maps and diagnostics to indicate the percentage of species with confirmed breeding. Unlike the overall richness map, there was no clear target because confirmation of breeding is dependent on several factors including the range of species present and the ease with which evidence can be collected. However, it was still felt that a low percentage of species with confirmed breeding evidence might be indicative of poor coverage. 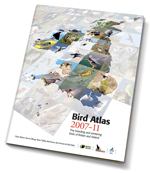 Additionally, users of the Bird Atlas Online system could use the ‘10-km Gaps’ option to see a map showing the percentage of species not yet confirmed to breed in 10-km squares in their area. With an aim to achieve coverage in at least eight tetrads in every 10-km square (every second square in Ireland) it was straightforward to map the 10-km squares that had met the target, and to show those areas still in need of additional coverage. For each season, two maps were produced showing whether the number of tetrads assigned to observers had met the target, and then once data started to come in, how many of the tetrads had been surveyed. The map on the left clearly shows the areas engaged in local atlases where all of the tetrads in a 10-km square were allocated for coverage. The tetrads actually surveyed can be seen here [link to Results: coverage]. Distribution maps for 12 species were shown on the website. The species were carefully selected to represent a number of key habitats so that gaps in the maps for these species would help to identify areas and habitats in need of additional field effort. These maps at Britain & Ireland scale were very useful for assessing overall coverage but often observers wished to see their own area at a finer scale. For this reason we made separate pages for each Atlas region showing the same information as above. For regions engaged in a local atlas we also showed tetrad-resolution species richness maps as shown below for County Waterford, the only Irish local atlas.